Spiced Lentil Chard Soup – Hariyali Dal. Creamy Red Lentils Cooked with Chard or other greens, tempered with whole spices. 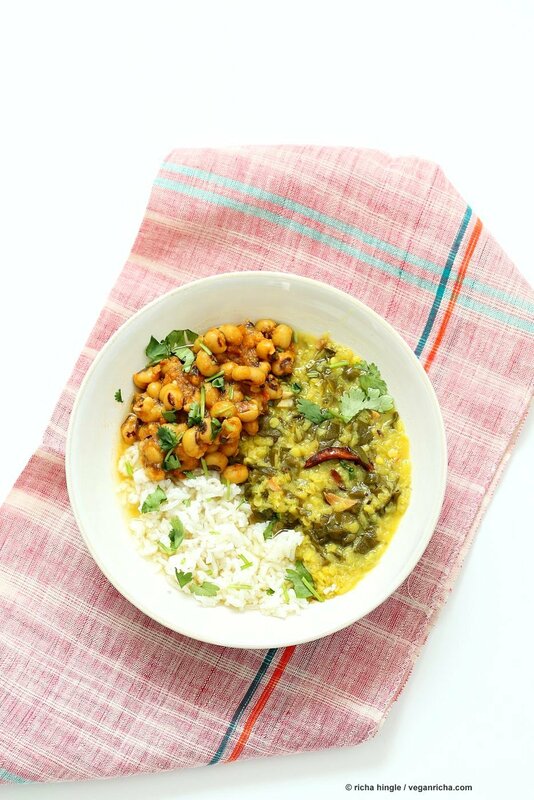 Easy weeknight Dahl. Vegan Gluten-free Soy-free Recipe. I know right. How many yellow Dals can there possibly be? Very many my friend, very very many! Today’s Dal combines chopped up chard leaves , grated ginger, chile and cashew cream while cooking the red lentils. Hariyali means greens, hence greens filled Dal (lentil soup). The tadka or tempering uses simple whole spices that infuse the soup with an amazing flavor. As with all Indian food, everything tastes even better the next day! Serve over cooked grains as white or brown rice, quinoa or millet, or with flatbread and a side of roasted veggies. Dal (a term used for any soupy preparation of lentils, split lentils, split beans and beans) has many variations and options. There might be regional recipes with local beans, family recipes, small variations in spices that completely change the flavor profile, soup or stews with veggies or other additions and what not. Fill up the pantry with lentils and beans and make a new Dal every week. For a video of how to make similar dal soup, see this Punjabi Dal Fry. Also try Mom’s favorite Sabut Masoor – or Brown Lentil Soup, or my Dad’s favorite Simple 5 ingredient Mung Dal. Make a Sri Lankan Red Lentil Curry for an incredible flavorful no garlic version. 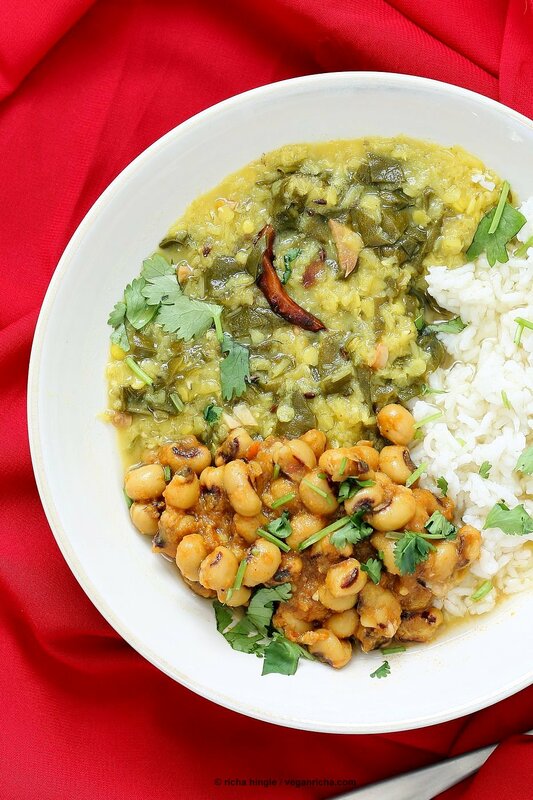 Make the dal into a meal by cooking grains with it like this Brown Rice and Lentil soup, or Mung Bean Brown rice Kitchari. As with most dals, often the lentils and beans can be used interchangeably (adjust water and cooking time depending on the lentil or bean). How do you like your red lentils? Red Lentils or Masoor Dal are made from Indian Brown Lentils. Brown lentils that have been dehusked are pink/orange, and then the lentils are split to make quick cooking red lentils. Depending on the brand or region, lentils that have only their skin removed but not split might also be called red lentils. However, those are not quick cooking red lentils or masoor dal. They will take longer to cook and will need more liquid and will not break down quickly. 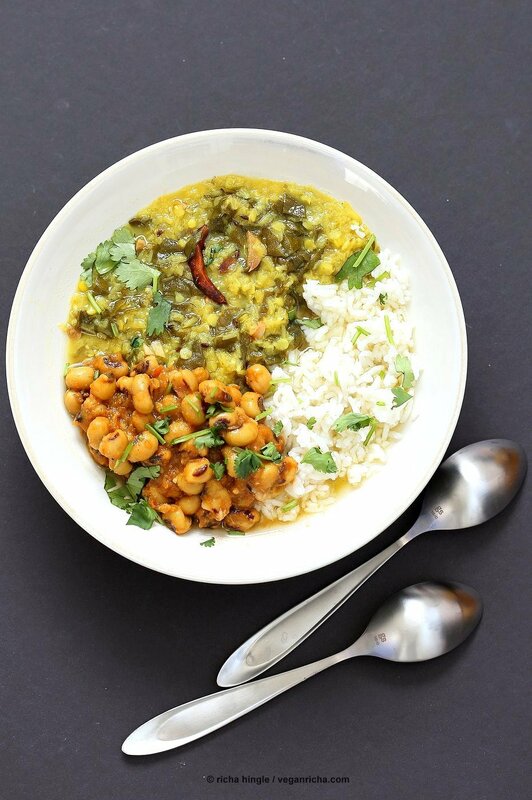 Bowl Pictured has Hariyali Dal, Rice and a quick version of Curried Black Eyed Peas. Pressure cooker/Instant pot: Manual for 1 to 2 mins. Natural release. Add ginger and chile and mix into the simmering lentils. You can also make a paste of the ginger chile and add to the saucepan. Add turmeric, salt, chard and cashew cream and mix in. Cook for another 10 mins over medium heat. Add lime juice to taste and continue to simmer over low heat while you make the tempering. At this point you can also add in 1 chopped tomato. Heat oil in a small skillet over medium heat. Add cumin seeds and let them start to change color. 2 mins. Add cardamom, cloves, cinnamon and red chilies and cook for a minute or until fragrant. Reduce heat to low-medium. Add garlic and cook until golden. 4 to 5 mins. Add this tempering to the simmering lentils, mix in. Cook for a minute. Let the Dal sit for a few minutes for the tempering to infuse. Taste and adjust salt and heat. Garnish with cilantro and red pepper flakes. Serve with cooked rice or grains or flatbread. You can remove the cinnamon stick and cloves just before serving. I usually leave it in and whoever gets it fishes it out. The whole spices cotinue to infuse the dish as they sit. Hi are you grinding the tempering spices or leaving them whole in the finished dish? Cinnamon stick and whole cloves…? Not grinding the tempering. The whole spices infuse the oil which infuses the dish. You can fish the cinnamon stick and cloves out before serving. Its almost the one linked on the post. I blend everything for the sauce(onion, ginger, garlic, tomato, spices), cook for a few minutes, add the cooked black eyed peas and simmer for some time and done. This is a perfect recipe for the changing weather and the chard waiting in my garden. Thank you! I know right. Ginger, cinnamon, turmeric and greens! Every time I see chile as an ingredient,I wonder if there’s a specific kind of chile that should be used. When I shop at the Indian market, there are so many types of hot peppers, including jalapenos, slender long hots, orange scotch bonnets, little tiny red peppers, habaneros, poblanos, and a number of others. Are they interchangeable, depending on how much heat I want in the dish, or are there specific chiles that you would recommend? I use Serrano or Bird’s eye chili . Sometimes I will use thai or cayenne, but they can get really hot. You can use most any chiles depending on the kind of heat you want in the dish , use milder ones for the flavor profile, but not heat and add heat (cayenne) later if you like. All of the hotter chiles (serrano, birds eye, thai, jalapeno) can range from mild to hot depending on the batch, which makes the hat in the dish variable dependent on the chile. Richa, I always look forward to getting a recipe from you. Couldn’t think of what to make for dinner and then this timely recipe came along….. 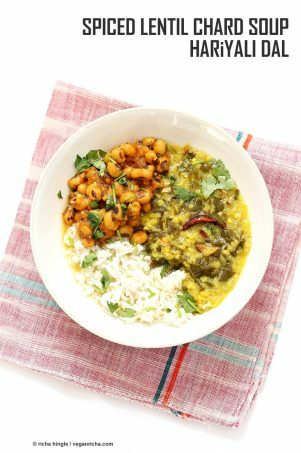 I have never made daal before and I can’t get over how easy but also how delicious and nutritious this recipe was! Even my picky teenagers loved it – yay! thank you for adding such delicious vegan recipes to my repertoire. i always want to try Indian foods. is it the dish Indian people usually eat in their meal? 🙂 i look forward to seeing your more recipe from India. so excited about it. I think of dal more as a sauce or a soup rather than a curry because IMO, it’s really liquidy! Doesn’t mean it can’t be delicious though! I love this recipe, and nothing wrong with yellow lentils! 3 years ago I’ve been to India, I’ve tried so many foods but I was really impressed by all the dishes made with rice and the way people having their meal. 🙂 this recipe makes me miss India so much. such a beautiful country. thanks for sharing, Richa. can a cardamom spice be used in place of the pods? Sure, add a 1/4 to 1/2 tsp directly to the simmering lentils. I made this Wednesday night for my husband & myself. It is delicious – and very forgiving! We bought the ingredients last weekend, so my serranos we less than very fresh. Our local grocery doesn’t carry chard (crazy) so we subbed mustard greens. And we used the coconut milk option, as we were out of cashews. This dish, over brown rice prepared in the oven, is a new favorite! Thank you! I like this recipe. Yellow color looks great and it seems quite delicious. I will try to make this dish. Thanks for sharing. I tried this & I used the split chickpeas. They were a little hard to eat, I am wondering if I should have soaked them before I cooked them. This was really different taste to the Punjabi Dal Fry Recipe & I liked it. I found the Cardamom a little strong so I will be cutting back on that. Do you think that I could do this without the spice for my parents? I also wanted to say that I like it that your recipes go in order of the list of ingredients, it really helps me to make sure I get everything in at the right time. Hi Shelby, Yes you can reduce the cardamom to 1 pod or just a few seeds from 1 pod. Split chickpeas and split peas are notorious in terms of cooking time. A fresh batch will cook within 30 minutes and some batches even after soaking overnight will need more than an hour. I prefer to pressure cook them (about 10 mins). You want to check on them and continue to cook until they are tender before adding the tempering. If the liquid reduces too much, add more water and continue to cook. It really depends on the batch. You can omit the green chile and red chilies and add a touch of cayenne if needed later. The rest of the spices are all flavor. These recipes are so great & I really appreciate you responding to the comments!I love when other’s have questions that I do & you have already answered my question when you responded to someone else. Ask away and I will try to answer. The restaurant versions might feel a bit different because of the extra oil/butter/fat in the food. I use quite minimal amount just for tempering the spices (the spices infuse the oil which infuses the dish). Add more and see if that works. Also try some of the mains from my book ( butter sauce, tikka masala sauce, pasanda sauce , korma etc). Those sauces are restaurant style. Just made this for dinner and it is EXTRAORDINARY!!! Thanks for sharing your talent with all of us Richa ???? Really great recipe! I did not have cinnamon sticks or cloves in hand but it still came out really well. In the future I will be doubling the recipe for left overs. Thanks! I made this last night for my family with red lentils and everyone LOVED it!! Even my dad who has crazy high standards for cooking rated it 10/10! You are a gift; thank you so much! SO good! I love trying new recipes from you. This one was pretty easy so I’ll be making it more.